Sai Grandeur is an ambitious new project of Land Trades and is designed for a life of luxury and style. It comprises of twin blocks ‘1’ & ‘2’, each 10 storeys tall. On offer are 120 apartments of two and three bedrooms, available in a choice of sizes ranging from 1280 SQ-FT to 2110 SQ-FT.
Sai Grandeur 1 & 2 is a well-planned residential complex in Mangalore, with all required facilities and amenities for comfortable living. The project is elegantly architectured with beautiful frontage and exquisitely planned interiors. It is comfortably positioned within a spacious compound, which is easily accessible with broad roads. Each apartment is thoughtfully designed to facilitate best use of available space, natural light and ventilation. Apt placement of bedrooms, bathrooms and kitchen as also the use of best quality construction materials, fittings and fixtures makes each house a pleasure to live in. 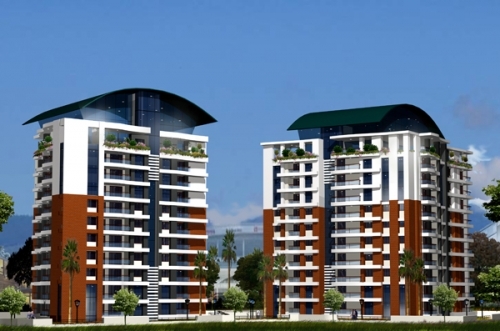 Sai Grandeur is situated on Jail Road in the heart of the city. Strategically situated at the junction opposite Capuchin Friary, this location places you within walking distance of Karangalpady / Bunts Hostel, M.G. Road and Bejai. Being primarily a residential locality, the entire area is calm and quiet. As our client profile mainly consists of eminent doctors, professionals, businessmen and NRIs, you are assured of a decent, dignified and secure neighborhood. As this area of the city has good future development potential, you can also expect to see steady growth in the value of your investment. This entry was posted in Property and tagged flats, Kodialbail, Land Trades, luxury apartments, Mangalore, new apartments, Sai Grandeur. Bookmark the permalink.